With the end of packing of the previous-season crop and the new crop of apple and pear expected shortly, it is important to prepare adequately to minimize decay rates during the long storage period. Several fungi that cause postharvest rots are known as airborne pathogens that release spores into the air of the room and a large number of the spores adhere to the walls, floors and bins. Penicillium spp. (blue mold), Mucor piriformis (Mucor rot) and Cladosporium spp. (Cladosporium rot) are the most important contaminant of storage facilities (Figure 1). Spores of other pathogens can also persist in facilities, especially on bins, but at relatively lower densities compared to the three mentioned pathogens. A large number of the spores generated in the previous season can persist and carry over to the following season if appropriate cleaning and sanitation practices are not implemented before the new crop is stored. Figure 1: Example of spores trapped on agar plates from the air (left) and walls (right) of a storage room at the end of a storage season. 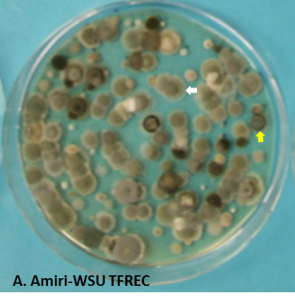 The white and yellow arrows indicate colonies of Penicillium (blue mold) and Cladosporium, respectively. When a fungus infects an apple or a pear, the resulting lesion often ends-up producing spores (Figure 2) which can be released in the air in the case of Penicillium, Mucor, Botrytis or Cladosporium and are spread by air circulation in the room. Spores can also be released in the dump water at packing or attach to the bins or walls and persist there if not washed or sanitized (Figure 2B). Figure 2: Example of infected fruit with sporulating lesion (yellow arrows) in bins (A, B) and rotten apple showing Penicillium spores left in a bin after packing (C). 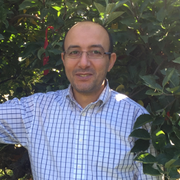 Because spores are the way through which fungi start new infection cycles, they will carry the sensitivity phenotype to fungicides over time if they survive and persist in a certain environment. As consequence, if spores that are resistant to a certain fungicide carry over to the following season, they will not be controlled by that same fungicide. 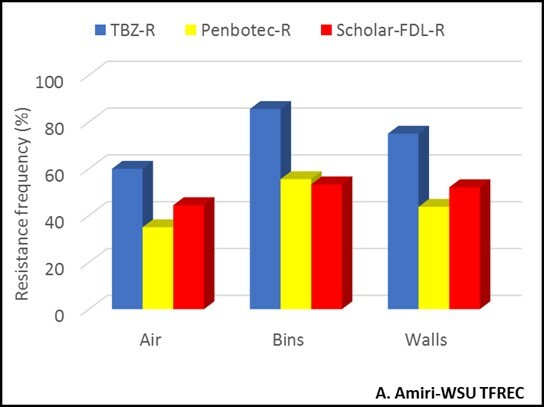 Figure 3 shows the resistance frequency to the three current postharvest fungicides, TBZ, Penbotec (pyrimethanil), and Scholar (fludioxonil), of the blue fungus (Penicillium) in the air, walls and the bins of a single storage room at the end of the season (July) prior to any sanitation. In most cases, resistance frequencies are higher than 40% and if these spores are not eliminated before the new crop is stored in the same rooms or bins, there is a high risk for the fungicide applied at harvest will not provide the adequate control level during storage. Figure 3: Resistance frequencies to TBZ (Mertect, TBZ), Penbotec (pyrimethanil), and Scholar (fludioxonil-FDL) Penicillium in spores collected for the air, walls and the bins of a single storage room in July 2017. Note that this a single example of one room and does not reflect the resistance levels in other rooms. To avoid recontamination, sanitation is better when completed close to harvest time. Keeping rooms closed but aired after sanitation will avoide or reduce recontamination. The first approach for sanitation is cleaning mainly, through washing. Bin washer systems at the end of the dump water tank considerably reduce the inoculum load on the bins before they are re-used or stored for the following season. These systems, either automatic or manual, utilize hot water as a cleaning agent. Crop debri(leaves) or rotten fruit left in bins (Figure 2C) or in rooms must be eliminated before applying any further sanitation measure to maximize efficacy. The characteristics and efficacy of some of the commonly used sanitizers are summarized in Table 1. 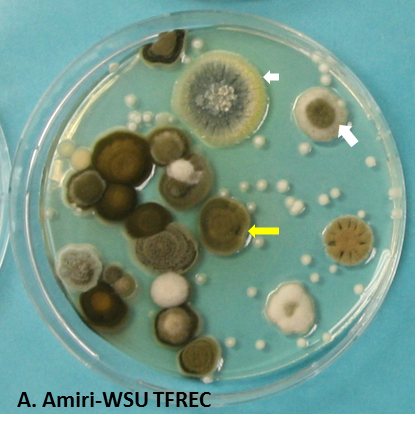 Their efficacy has been better evaluated for Penicillium and to some extent Mucor but is still unknown against other postharvest fungal contaminants. Chlorine products and chlorine dioxide are among the most used sanitizers especially in the water tank. Their efficacy is good but requires keeping the pH level constant. Quaternary ammonium (Quat) products have also shown some efficacy against Penicillium in bin sanitation but its efficacy declines in hard water. Peroxides have shown similar efficacy to Quat products but some studies have reported an increase in the number of Penicillium spores after treatment, especially in wet conditions (walls) and when rooms were closed during or after treatment. Ozone can be applied as a rain (liquid), gas or fog. The key factors are dose and exposure time. For sanitation of empty rooms or bins, a 0.8 to 1.0 ppm applied for 24 hrs reduced spore load by 80 to 90%. Caution should be observed to minimize oxidizing effect especially if used repeatedly on long term. Table 1: Summary of most common sanitizers in pome fruit environments. 1This list is not exhaustive, 2Efficacy may vary among pathogens, 3On wooden bins and empty rooms, 4Na and ca indicate sodium and calcium hypochlorite, 5Not on fruit. Adapted from Schmidt (1997) and Sholberg 2004. Fruit Matters articles may only be republished with prior author permission © Washington State University. Reprint articles with permission must include: Originally published by Washington State Tree Fruit Extension Fruit Matters at treefruit.wsu.edu and a link to the original article.